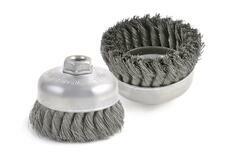 Wire cup brushes are industrial brushing tools for surface preparation, deburring, blending, and surface finishing. They feature a cup-like body, metal wire filaments, and an arbor hole or shaft that supports their use with grinding tools or other powered equipment. Wire cups are best-suited for surface preparation and deburring on large surfaces, but industrial buyers need to select the right brushing tool for the job. By understanding wire cup specifications and styles, you can make the right choice for your application. A type of power brush, wire cup brushes from Brush Research Manufacturing (BRM) have stainless steel or carbon steel filaments. 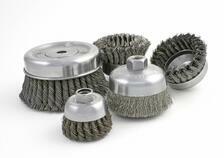 Carbon steel brushes provides excellent cutting action and fatigue resistance. 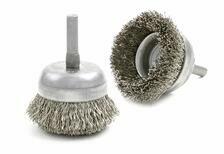 Stainless steel brushes are a great choice for aluminum, stainless steel, and other non-ferrous metals. Wire cup brushes with stainless steel filaments also help to reduce the risk of after-rust appearing on the workpiece surface. Wire cup brushes also come in different tool diameters and wires sizes. For example, wire cups from BRM include small-diameter tools that are available in diameters ranging from 1-3/4” to 2-3/4”. Larger wire cups come in diameters as large as 6”. Typically, wire or filament sizes are given as decimal measurements. The larger the wire size, the more aggressive the brush tool. Trim length is another important specification to consider. Wire cup brushes with longer trim lengths are less aggressive, but more flexible. Consequently, these brushing tools are the right choice for reaching curved or recessed areas. Wire cup brushes with shorter trim lengths are more aggressive, but less flexible. Typically, these industrial brushes are used in heavier-duty applications. When selecting wire cup brushes, industrial buyers can choose brushing tools with crimped wire or knotted wire filaments. During cutting and cleaning, small pieces of wire can break off from a brush’s tips. A wire cup’s knotted ends help to support the tips of the wires while promoting more aggressive brushing action. Crimping also allows metal filaments to better support each other. As this video shows, crimped wire brushes are great for rust removal. Crimped wire cup brushes are more flexible than knotted wire cups, but crimped tools are also less aggressive. For heavy-duty applications, choose knotted wire cup brushes instead. Then specify single-row, double-row, or cable twist designs. Single-row knotted wire cups are used for removing burrs, weld scale, paint, or rust. Double-row, knot-type cup brushes provide fast cutting and cleaning over wide areas. Both single-row and double-row wire cup brushes feature filament ends that are loosely twisted and tufted for added flexibility. By contrast, knotted wire cup brushes with a cable twist have wide, tightly-twisted ends for more aggressive brushing. Applications for these industrial brushing tools include heavy-duty burr removal, surface preparation, and surface finishing. Do you need wire cup brushes for industrial deburring or surface finishing? Do you wire cups for surface preparation tasks like removal instead? For more information about wire cup brushes, including product specifications and styles, download the BRM Product Catalog.